No-drama Obama Democrat blogging about politics, arts, food, gardening, nature. Always under construction. 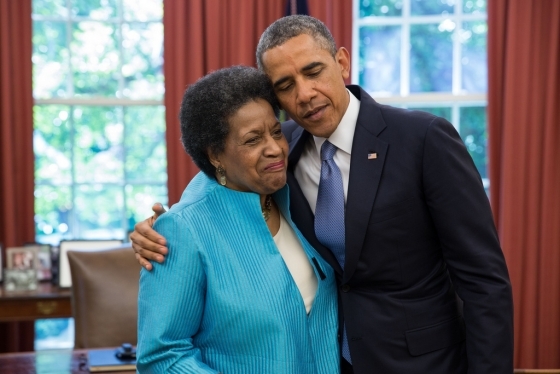 President Barack Obama and Myrlie Evers-Williams at the White House, June 2013. Pete Souza photo. This entry was posted in civil liberties, civil rights, history, human rights, justice, law, video, White House and tagged Barack Obama, civil rights, Medgar Evers, Myrlie Evers-Williams, POTUS, Rev. Al Sharpton, White House on June 13, 2013 by Kat 4 Obama. Every year since taking office, President Obama has invited members and allies of the LGBT community to celebrate Pride Month at the White House. This year, the White House invited nine ordinary Americans from across the country — all members or allies of the LGBT community who wrote letters to the President — to attend the Pride Month Reception on Thursday, June 13. This entry was posted in civil rights, video, White House and tagged Barack Obama, LGBT, POTUS, Pride Month, video, White House on June 13, 2013 by Kat 4 Obama. “This week, the Senate will consider a common-sense, bipartisan bill that is the best chance we’ve had in years to fix our broken immigration system. It will build on what we’ve done and continue to strengthen our borders. It will make sure that businesses and workers are all playing by the same set of rules, and it includes tough penalties for those who don’t. It’s fair for middle-class families, by making sure that those who are brought into the system pay their fair share in taxes and for services. And it’s fair for those who try to immigrate legally by stopping those who try to skip the line. It’s the right thing to do. Now, this bill isn’t perfect. It’s a compromise. And going forward, nobody is going to get everything that they want — not Democrats, not Republicans, not me. But this is a bill that’s largely consistent with the principles that I and the people on this stage have laid out for common-sense reform. First of all, if passed, this bill would be the biggest commitment to border security in our nation’s history. It would put another $6.5 billion — on top of what we’re already spending — towards stronger, smarter security along our borders. It would increase criminal penalties against smugglers and traffickers. It would finally give every employer a reliable way to check that every person they’re hiring is here legally. And it would hold employers more accountable if they knowingly hire undocumented workers. So it strengthens border security, but also enforcement within our borders. I know there’s a lot of talk right now about border security, so let me repeat — today, illegal crossings are near their lowest level in decades. And if passed, the Senate bill as currently written and as hitting the floor would put in place the toughest border enforcement plan that America has ever seen. So nobody is taking border enforcement lightly. That’s part of this bill. Number two, this bill would provide a pathway to earned citizenship for the 11 million individuals who are in this country illegally. So that pathway is arduous. You’ve got to pass background checks. You’ve got to learn English. You’ve got to pay taxes and a penalty. And then you’ve got to go to the back of the line behind everybody who’s done things the right way and have tried to come here legally. So this won’t be a quick process. It will take at least 13 years before the vast majority of these individuals are able to even apply for citizenship. So this is no cakewalk. But it’s the only way we can make sure that everyone who’s here is playing by the same rules as ordinary families — paying taxes and getting their own health insurance. That’s why, for immigration reform to work, it must be clear from the outset that there is a pathway to citizenship. If we’re asking everybody to play by the same rules, you got to give people a sense of certainty that they go through all these sacrifices, do all this, that there’s at the end of the horizon, the opportunity — not the guarantee, but the opportunity — to be part of this American family. And by the way, a majority of Americans support this idea. Number three, this bill would modernize the legal immigration system so that, alongside training American workers for the jobs of tomorrow, we’re also attracting the highly skilled entrepreneurs and engineers from around the world who will ultimately grow our economy. And this bill would help make sure that our people don’t have to wait years before their loved ones are able to join them here in America…. This entry was posted in civil rights, economy, education, employment, human rights, immigration, national security, Senate, video, White House and tagged Barack Obama, citizenship, DREAMers, engineers, entrepreneurs, immigrants, immigration reform, POTUS on June 12, 2013 by Kat 4 Obama. “It’s now been nearly five years since an economic crisis and a punishing recession came together to cost far too many Americans their jobs, and their homes, and the sense of security that they had built up over time. And by the time I took office, my team and I were facing bubbles that had burst; markets that had cratered; bank after bank on the verge of collapse. And the heartbeat of American manufacturing, our auto industry, was flatlining. And all this meant that hundreds of thousands of Americans were losing their jobs each month. So this was a scary time. And nobody had any idea where the bottom would be. Four and a half years later, our businesses have created nearly 7 million new jobs over the past 36 months. The American auto industry has come roaring back. We’re producing more of our own energy, we’re consuming less that we import from other countries. Our deficits are shrinking rapidly. The cost of health care is slowing. The housing market is rebounding. People’s retirement savings are growing. The wealth that was lost from that recession has now been recovered. All of this progress is a testament to the grit and resolve of the American people, most of all. But it’s also due in some measurable way to the incredible dedication of the men and women who helped to engineer America’s response. And two of those people are standing next to me, two very smart economists: Alan Krueger and Jason Furman…. And Alan is driven by the basic bargain at the heart of our economy — the idea that hard work should be rewarded. He’s motivated by the principle that no one who works full-time in the greatest nation on Earth should have to raise their families in poverty or below poverty levels…. I’m also proud to nominate another outstanding economist to take his place. Jason Furman is one of the most brilliant economic minds of his generation, don’t take my word for it — you can talk to other economists who know a lot more than I do about it. He’s won the respect and admiration from his peers across the political spectrum. His Ph.D. thesis advisor, Greg Mankiw, chaired the Council of Economic Advisers under George W. Bush. Nobel Prize Winner Joe Stiglitz, on the other side of the economic spectrum, hired Jason to work for the CEA under President Clinton. After leaving President Clinton’s White House, Jason finished his Ph.D. in economics, quickly acquired a reputation as a world-class scholar and researcher. But public service kept calling, and Jason kept answering that call because he believes deeply in it. So from working at the World Bank on issues of inequality and international finance to developing new proposals to strengthen our health and retirement programs, he helped to shape some of our most important economic policy debates. …. And over the last five years I’ve come to trust not only his head, but also his heart, because Jason never forgets who it is that we’re fighting for: middle-class families, folks who are working hard to climb their way into the middle class, the next generation. And when the stakes are highest, there’s no one I’d rather turn to for straightforward, unvarnished advice that helps me to do my job. He understands all sides of an argument, not just one side of it. He’s worked tirelessly on just about every major economic challenge of the past four and a half years, from averting a second depression, to fighting for tax cuts that help millions of working families make ends meet, to creating new incentives for businesses to hire, to reducing our deficits in a balanced way that benefits the middle class…. This entry was posted in economy, employment, government, Senate, video and tagged Alan Krueger, Barack Obama, Council of Economic Advisors, Jason Furman, job creation, jobs, POTUS, recession, Senate on June 12, 2013 by Kat 4 Obama. “Over the course of her career, a working woman with a college degree will earn on average hundreds of thousands of dollars less than a man who does the same work. Now, that’s wrong. I don’t want that for Malia and Sasha. I don’t want that for your daughters. I don’t want that to be an example that any child growing up ends up accepting as somehow the norm. I want every child to grow up knowing that a woman’s hard work is valued and rewarded just as much as any man’s. Now, what’s important to realize also, though, is this is not just an issue of fairness. This is a family issue. This is a middle-class issue. This is an economic issue. Just last week, a report confirmed what we already know: that women are increasingly the breadwinners for American families. Women are now the primary source of income for nearly 40 percent of American families. Forty percent — almost half. That’s not something to panic about, or to be afraid about -– that’s a sign of the progress and the strides that we’ve made. But what it does mean is that when more women are bringing home the bacon, they shouldn’t just be getting a little bit of bacon. (Laughter.) If they’re bringing home more of the income and that income is less than a fair share, that means that families have less to get by on for childcare or health care, or gas or groceries. It makes it harder for middle-class families to save and retire. It leaves small businesses with customers who have less money in their pockets — which is not good for the economy. That’s not a good example to set for our sons and daughters, but it’s also not a good recipe for long-term, stable economic growth. So to anyone who says 77 cents on the dollar sounds pretty close to equal, I say, your math is bad…. That’s why, as Valerie mentioned, I created the first-ever White House Council on Women and Girls, which is working to close that gap…. It’s why I established a National Equal Pay Task Force to help crack down on violations of equal pay laws, which, by the way, they’re doing at a record rate. And, through education and outreach, they’re also helping employers develop tools to comply with the nation’s equal pay laws on their own. And that’s why, earlier this year, I signed a presidential memorandum directing the federal government to close that gap for good for its employees. (Applause.) We have to set an example. It’s also why we’re using the latest technology to help workers get the information they need to figure out if they’re underpaid…. Now is the time for us to encourage more young women to pursue math and science education. Now is the time for us to hire more STEM teachers so all our children are prepared for the high-tech, high-wage jobs of tomorrow. Now is the time to make sure businesses offer men and women the flexibility to be good employees and good parents. And I really want to commend Deloitte and SumAll, and the CEOs who are with us here today, they are creating exactly the kinds of innovative workplaces that help hard-working Americans thrive, and they’re committed to pay equity. And so when you have a chance to talk to Joe, say thank you. And the CEOs who are out there, if you want a first-class company that is tapping into the talents and resources of all your employees, make sure that you’re putting in place systems so that they all feel like they’re being treated fairly and equally. It’s a simple principle and it’s a powerful one. And now is the time to make sure that we are putting in place a minimum wage that you can live on — (applause) — because 60 percent of those making the minimum wage are women. This entry was posted in civil rights, Congress, economy, education, employment, government, history, human rights, video, women's rights and tagged Barack Obama, economy, education, Eqyal Pay Act, JFK, jobs, minimum wage, POTUS, STEM, video, women on June 12, 2013 by Kat 4 Obama. This week, the President urged Congress not to let student loan rates double and to confirm three judges for the federal appeals court in Washington, held bilateral meetings with the NATO Secretary-General and the President of Chile, kicked off a National Conference on Mental Health, honored the Super Bowl champions, and announced a major new initiative called ConnectED, while the Vice President wrapped up a weeklong trip to South America. This entry was posted in Congress, courts, diplomacy, economy, education, obstruction, Senate, video, West Wing Week and tagged Barack Obama, Chile, ConnectED, Joe Biden, judicial nominations, NATO, POTUS, South America, student loan rates, VPOTUS on June 9, 2013 by Kat 4 Obama. “Hi, everybody. In the next few days, America will take an important step towards fixing our broken immigration system. The entire United States Senate will begin debating a commonsense immigration reform bill that has bipartisan support. See, we define ourselves as a nation of immigrants. The promise we find in those who come from every corner of the globe has always been one of our greatest strengths. It’s kept our workforce vibrant and dynamic. It’s kept our businesses on the cutting edge. And it’s helped build the greatest economic engine the world has ever known. But for years, our out-of-date immigration system has actually harmed our economy and threatened our security. Now, over the past four years, we’ve taken steps to try and patch up some of the worst cracks in the system. We strengthened security on the southern border by putting more boots on the ground than at any time in our history. And, in part, by using technology more effectively – today, illegal crossings are near their lowest level in decades. We focused enforcement efforts on criminals who are here illegally – who endanger our communities – and today, we deport more criminals than ever before. And we took up the cause of “Dreamers,” the young people who were brought to this country as children. We said that if they’re able to meet certain criteria, we’d consider offering them the chance to come out of the shadows so they can continue to work here, and study here, and contribute to our communities legally. But if we’re going to truly fix a broken system, we need Congress to act in a comprehensive way. And that’s why what’s happening next week is so important. The bill before the Senate isn’t perfect. It’s a compromise. Nobody will get everything they want – not Democrats, not Republicans, not me. But it is a bill that’s largely consistent with the principles I’ve repeatedly laid out for commonsense immigration reform. This bill would continue to strengthen security at our borders, increase criminal penalties against smugglers and traffickers, and hold employers more accountable if they knowingly hire undocumented workers. If enacted, it would represent the most ambitious enforcement plan in recent memory. This bill would provide a pathway to earned citizenship for the 11 million individuals who are in this country illegally – a pathway that includes passing a background check, learning English, paying taxes and a penalty, and then going to the back of the line behind everyone who’s playing by the rules and trying to come here legally. This bill would modernize the legal immigration system so that, alongside training American workers for the jobs of tomorrow, we’re also attracting highly-skilled entrepreneurs and engineers who will grow our economy. And so that our people don’t have to wait years before their loved ones are able to join them in this country we love. That’s what immigration reform looks like. Smarter enforcement. A pathway to earned citizenship. Improvements to the legal immigration system. They’re all commonsense steps. They’ve got broad support – from Republicans and Democrats, CEOs and labor leaders, law enforcement and clergy. So there is no reason that Congress can’t work together to send a bill to my desk by the end of the summer. We know the opponents of reform are going to do everything they can to prevent that. They’ll try to stoke fear and create division. They’ll try to play politics with an issue that the vast majority of Americans want addressed. And if they succeed, we will lose this chance to finally fix an immigration system that is badly broken. So if you agree that now is the time for commonsense reform, reach out to your Representatives. Tell them we have to get this done so that everyone is playing by the same rules. Tell them we have the power to do this in a way that lives up to our traditions as a nation of laws, and a nation of immigrants. In the end, that’s what this is all about. Men and women who want nothing more than the chance to earn their way into the American story, just like so many of our ancestors did. Throughout our history, that has only made us stronger. And it’s how we’ll make sure that America’s best days always lie ahead. This entry was posted in civil rights, Congress, economy, employment, GOP, government, human rights, immigration, obstruction, Senate, video, Weekly Address, White House and tagged Barack Obama, citizenship, Congress, DREAM Act, immigration, immigration reform, POTUS, video on June 9, 2013 by Kat 4 Obama. Now it can be told: I'm not actually a cat. An Accidental Historian, writing about the people who worked in the Territory West of the Rocky Mountains before 1858 -- so many good stories!